Is Greece expensive? According to the world’s most comprehensive cost of living analysis published June 2007, Athens is the 29th most expensive city in the world. The latest comparison can be found at, “Cost of living in Athens, Greece vs. the world 2009.” To check the prices of groceries and services, go to “Greece vs. USA price comparison 2008” for a comprehensive list. Europe dominated the survey, placing 30 cities in the Top 50 — including Athens, the biggest climber amongst them. Of the U.S. cities, only New York City and Los Angeles made the top ranks at number 15 and 42, respectively. Mercer Human Resource Consulting in the UK, which produces the Cost of Living survey, performs an annual comparative cost analysis of more than 200 factors that include housing, transportation, food, clothing, entertainment and common household products in 143 cities on six continents. The survey is used to help multinational companies and governments determine compensation allowances for their expatriate employees, and ultimately drives economic outlook on the future of business and expansion in those respective countries. Some claim this survey is inaccurate in calculating local costs, but last I checked, local residents and expatriates patronize the same stores, eat the same food and use the same hospitals, garbage service, electricity and water. Cost of living is the same for everyone. See the Cost of Living Survey – Top 50 – Worldwide Ranking 2007 in its entirety. What about quality of living? 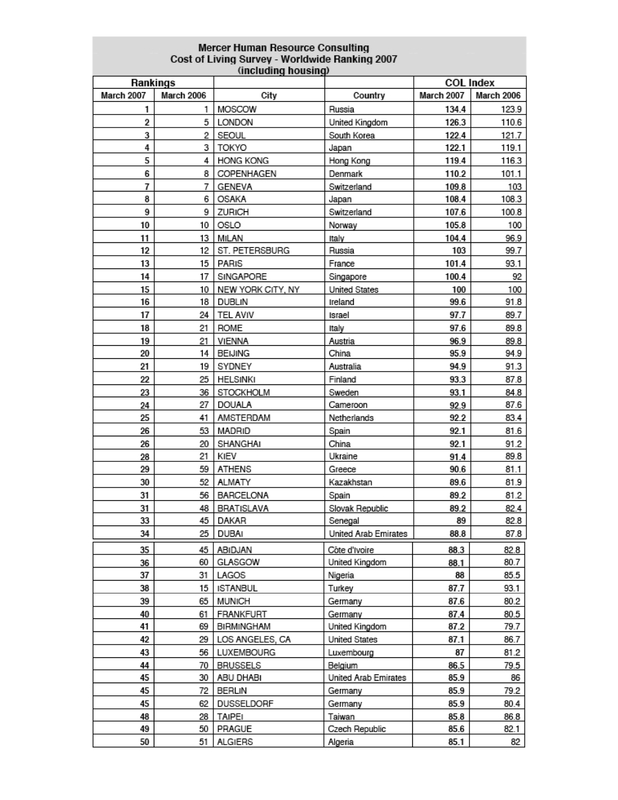 In contrast to Athens moving up 30 places in the cost of living survey to number 29, it fared poorly in the quality of living survey at number 78. This indicates that expenses and inflation are rising quickly, while the quality of life and salaries stagnate and stay the same. If you are looking for a more up-to-date survey, see the “Athens, Greece: Cost of living survey 2008.” Athens is now the 25th most expensive city in the world, so Greece is getting more expensive. I have posted an article from Forbes on Megacities of the World. Hey Kat, I cannot download the document. Can you please fix this? Also, a link to the website of the company that produced this document would be appreciated, even if they do not offer the document for download, as long as they claim to be the authors of the document. Thanks Ramesh for your nice comment. The article from Forbes does not include Athens, and I prefer links to articles that pertain to Greece, this post specifically (which is on cost of living) and/or original content, so I regret to inform you that it was removed. For those who are interested, the megacities are Tokyo, Mumbai, Mexico City, Sao Paulo, NYC, Delhi, Shanghai, Calcutta, Dhaka and Jakarta, and it refers to population and the daunting problems faced by continued expansion. P.S. You are also not in Dubai. Διαγόρας – Thanks for letting me know that the link went dead. It’s not a download, it’s a jpg attached to my site that I compiled. It says they are the authors on the document. Rositta – For me it wasn’t a big shock because I’ve been telling people for years it isn’t that cheap. I always go to the grocery store in countries I visit, and Stockholm was pretty much the same (though their government provides a lot more with those taxes and salaries are much higher), Barcelona was cheaper, and NYC was even cheaper than Athens on many counts. NYC is high on the list because of rent, not because of services or products. this makes sense. i keep hearing that prices are going up every year–hell when i was there it wasn’t cheap– and i was getting the feel it was becoming more expensive than my own city to live in; this survey confirms it. jesus christ. it’s in the top 30 most expensive cities in the world; no wonder the black market continues to thrive and expand. Yiannos, nice to see you back here. I like when you drop by and comment. As proof of what you suspected, I’ll give you an example. Something I bought in February was 5.68 (not on sale); today June 21, the same item is 6.36 (on sale). Scary, eh? That’s a 12 percent increase in 4 months. Combine that with the fact rent increases about 5 percent if your lease is renewing. With annual salary increases of under 4 percent that supposedly keep pace with the rate of inflation, I don’t think someone is crunching the figures correctly and we’ll all be broke soon enough! I wouldn’t mind paying these prices if the quality of living kept pace, but it’s just not the case. My friends in Sweden keep saying how expensive it is to live there, but I’ve seen prices (I lived there) and they’re the same or cheaper than here. The difference is, they’re getting something for what they pay; people in Greece are getting nothing, we’re just paying. This is interesting, thanks for posting it. And it is certainly my experience that Athens is getting more expensive every year. But for people who have been living in Greece year in, year out, the cost of living in Greece has not jumped dramatically in the past year. If you read the text accompanying the chart, the reason its author says European cities are dominating the top spots is the strength of the Euro. Likewise, only two American cities made the list of 50 because of the weak American dollar. The purpose of the list is “to help multinational companies and governments determine compensation allowances for their expatriate employees,” not to help Greek residents figure out the state of the economy. But hey, I’m just a detail gal, so don’t mind me. I was really interested by the survey and happy you posted it. Thanks again. True Eleni, it’s not necessarily an indicator of the economy. But I’m both a details AND big picture gal, and if you put them together, it’s not difficult to figure out that if products can increase 12% in 4 months, and low salaries are going nowhere, then one can do the math and see that cost of living is not keeping pace with quality of living. If Athens jumped 30 places, and places like Zurich or Munich only inch a few, that means their economies are fairly stable and cost of living isn’t impacted as much, with or without the strength of the euro. Maybe you didn’t notice a huge difference from last year, and that may be due to different reasons — you don’t earn a Greek salary, your second home is not Athens but in a village on an island, you don’t live or work in Greece full-time. I didn’t notice as much either when I was earning an American salary and lived here only part-time. Like I said, if Athens’ QUALITY of living (Athens isn’t in the Top 50) was rising as fast as the cost of living, I’d have no problem. But it isn’t, so perhaps the survey is done to figure reimbursement for employees, but when you compare it to the cost of the same things in other countries where salaries are 30-85% higher for the same job, it’s pretty clear what it means for Greeks, as well. i.e. I’m paid 84% less for the same job here that I do in the USA, however the cost of food and services is the same or higher. Btw, if a rise in cost of living isn’t an indicator of economy, why didn’t the major newspapers in Greece proudly show it off? I have a Greece vs. USA cost of living comparison I’ll post, and people can see for themselves. exactly. the fact that Athens has managed to jump 30 places, and the greek economy has not experienced a substantial growth burst relative to the same period, hints that there must be underlying factors of the potentially dangerous variety, lingering beneath the surface. articles like this scare me. i find myself worrying about Greece regularly. alright. you have been in Greece for how long now? 10 years was it? the plane is going to crash into the mountain soon no? i don’t know how much longer these price hikes will be able to continue unimpeded before the whole system collapses on itself. maybe that’s what Greece needs; the opportunity to start all over building from the ground up, like it should have after the junta. Lets assume that you were indeed doing exactly the same job in the states and you were earning 84% more than in greece. What was the percentage difference for your rent and the welfare contributions of you and your employer. I bet that when you add these up the difference will be around 10% maybe less if you lived in NY. and dont forget the average of 3 weeks annual leave and the 12 public holidays in contrast with the 2 weeks average US annual leave and the 8 public holidays. Moreover, were there 300 days of sunshine and access to lovely beaches and amazing food in the US? What about 3000 years of history and an endless list of sights to explore? How about the ability to hop into an easyjet flight and spend a weekend in paris, london, rome or berlin? Could you walk home in the US, wearing a mini skirt, half drunk at 4am? ^^Teli, with all due respect, i seriously doubt the average Greek is jumping on a plane to visit paris and rome every second weekend; statistics prove that Greeks mostly spend holidays in Greece. as for the food and ‘culture’, yeah it’s great, but sitting at a restaurant for 6 hours, or at a cafe nursing a drink for 4 hours, doesn’t strike me as being the most productive use of one’s time. Southern Europe has always been like this, and i seriously think it would be a mistake to rip the context out of the argument(i.e the economic circumstances, both past and present) when discussing the alleged virtues of the ‘good life’. just because Greeks have managed to fashion denial into a functional artform resembling a lifestyle, it doesn’t mean it’s impressive. some people actually want to do something with their lives. Yiannos – Always good to get your intelligent input and sound commentary. Indeed, lazing around on a beach in summer and in a cafe in winter is not a lifestyle. It also suggests nothing of a “good life.” To many, “good life” includes doing something useful and purposeful, not just being Hedonistic. To Teli and anyone else presenting a case – Make sure you have your facts correct and do your calculations/research correctly (or consult someone if you don’t know how to do it yourself) before you end up looking foolish. It also helps if you actually have first-hand experience regarding the things you’re criticizing, otherwise you have zero credibility. (You’re in Brentwood, UK according to your IP address and visiting this site either from home or during work hours, so I see your job doesn’t keep you busy enough. Visiting Greece once a year and being in NY once doesn’t count as living in either of those places). First, when I say I’m earning 84% less for the same job, reversing the equation is not calculated by saying “84% higher.” If I’m making 84% less than an American salary (using $75,000 as the target), that comes out to be $75,000 – (75,000 x 84%) or 75,000 – 63,000 = 12000. A quicker way to make that calculation is 75,000 x 16% = 12000. So if you wanted to calculate the reverse, it’s not 12,000 + 84%; it would be 12,000 x 625% = 75,000. (You’re free to see the tax statements of myself and any Greek-American who has experienced the same thing). When I lived in NY, I paid $1100 for a 100 sq meter 2nd floor apartment with 2 bedrooms, a full kitchen with appliances provided, living room and balcony along with a concierge and private coded lock. It had an air conditioner, insulation in the walls and roof (aka, it was cool in summer and warm in winter) with double paned windows (aka, no noise), and a storage space. It was 4 blocks walking from the metro, a 15-minute ride to downtown, and surrounded by restaurants, cafes, supermarkets and anything else I could want. Let’s just say 75,000 was my salary (it was actually higher, but let’s just continue with that figure). Out of that, I could pay up to 35% taxes which went to the city, state and payments towards welfare, disability and social security so that’s $48,750 net. I could reduce my tax by making contributions to an IRA, retirement or other savings program that transferred my money directly to an account and was not taxed. If I paid too much tax at the end of the year, it would be refunded. If not, I paid what I owed. My company matched 100% of our 401K contributions. The dollar is weak against the euro, but the net salary still comes out to be 3.5 times or 350 percent more than a Greek salary. In addition to my salary, I was provided with full medical, dental and vision insurance that covered everything except a deductible of $50-200 on some things and half or all the cost of pharmaceuticals. I was not restricted to only doctors in my plan and could participate in alternative methods of healing such as a chiropractor and acupuncture. My work also provided me with child care (I didn’t have kids, but it was nice to know I had that), ongoing training paid by the company to update my skills or learn something new, a program that matched 100% of my charitable contributions up to $1000 to any non-profit organization, a gym membership to keep us in shape and an incentive for using public transportation. I had 3 weeks vacation. Some companies offer less vacation of 2 weeks and you earn more days with each year, and some companies give you up to 4 weeks. It’s negotiable, especially for educated and experienced employees such as myself. So essentially, after my rent, electricity, transportation and phone bill was paid, I still had money to save, invest, give away or spend on hair, nails, massage, dry cleaning, dinners out, vacation. Also, the USA has 10 public holidays (New Year’s, Martin Luther, President’s Day, Memorial Day, Independence Day, Labor Day, Columbus Day, Veterans Day, Thanksgiving and Christmas), not 8. I’ve worked for companies that also grant up to 10 days sick leave with pay; not all do, but some have this program and you can carry them over to the next year. I’d also like to note that some of my bosses in Greece have demanded I work on Greek national holidays for no extra pay or compensation. It’s true that there are only an average of 150 days sunshine in NY, but there are benefits to that also. New York is not my favorite state or city, but there is something natural about having defined seasons. The snow and ice make it possible for a white Christmas and skating in Rockefeller Square, the warm colors of leaves mark the beginning of Fall, and having rain means there is no drought as faced by much of Greece. You can find sunshine and beaches in California (where I’m from), but there’s much more to life than sun and beaches. With regard to amazing food, you’ve obviously not lived in the USA or you’d know that statement claiming Greece is superior is laughable. And that pertains to taste, cost, quality and variety. I agree that 3000 years of history and ancient sites are great things about Greece, but these things do not contribute to the quality of living on a daily basis and most Greeks I’ve met haven’t even seen them. I agree it’s great to spend a long weekend in Paris, London, Rome or Berlin, but it’s quite unfair to make this comparison since the USA is twice the size of the whole of Europe. And what good is having proximity to these places if the average person cannot afford to go there without living with his parents or taking a second job or being independently wealthy? Last but not least, when is wearing a mini skirt and walking home half drunk at 4 a.m. an indication of a great country? But to humor you, let’s say it is. First, I’ve been hassled plenty wearing more clothes than that in broad daylight; second, there are places in the USA (including Manhattan) where it happens and these women are perfectly safe. If you didn’t feel safe, maybe you shouldn’t frequent notoriously bad neighborhoods or put on a miniskirt. Money is not the most important thing in life, but to me it’s a form of freedom. If beaches and sunshine, ancient history, simpler living and walking home half drunk in a mini skirt are important to you, so be it – stop living in the UK and come live in Greece. If straightforward bureaucracy, decent wages, diversity in products/services at a reasonable price and quality standard of living are important to you, that’s OK too. I’m sure starting a new life in the UK was much easier for you since it fits the profile of the latter country and not Greece; if you were a non-EU coming to Greece, you’d know what I meant but of course you never will. (Btw, non-Greeks stating the truth is not bitching and whining, it’s still called telling the truth). But even a Greek living here can see what I see. Choosing one country over another is an individual choice based on priorities and options. As a result of being American and living in several cities worldwide, I know there are a lot of beautiful countries with advantages and disadvantages. But if I’d only lived in Greece my whole life and never experienced real life in another place, I still don’t think I’d be nationalistic, narrow-minded and arrogant enough to believe my country was better than another. That’s like tasting beans and proclaiming them the best without having tried anything else on the menu. Idealizing and romanticizing your country is so much easier when you don’t actually live in it. “The Greeks are proud yet chauvinistic. We always mumble and complain amongst ourselves about the mess in this country, but when a foreigner points out the mess, the Greeks all start to curse him that he speaks in an anti-greek and hostile manner. This is much like our lives. It’s always the state’s or someone else’s fault, not ours. We are like poor heirs: It is announced that we have been given a huge legacy, but as the peasants we are, we waste it lavishly here and there; and instead of nectar and ambrosia, we are willing to feed on the trash of subculture that haunts our daily lives. Greece is an extremely beautiful but cheap prostitute, and the Greek is her pimp. He is always telling her how beautiful she is, how much culture she has, how privileged he is in comparison to the ξένους, but when they are alone, he beats her, sells off her precious treasures, trades off her property and tries to convince her that all of this is happening because of her inabilities and weaknesses.